A lot was made about the slow-motion video capability of the iPhone 5S at its recent launch. However, today we have some news about iPhone 5S slo-mo vs. Galaxy Note 3 video, and it seems that an update is required. If we had to pick the two smartphones that are being most talked about at the moment we’d probably say the Apple iPhone 5S and the Samsung Galaxy Note 3. Both are notable handsets but recent testing has shown that although the iPhone 5S outputs video at 720p, it doesn’t actually capture video at 720p in slow-motion. 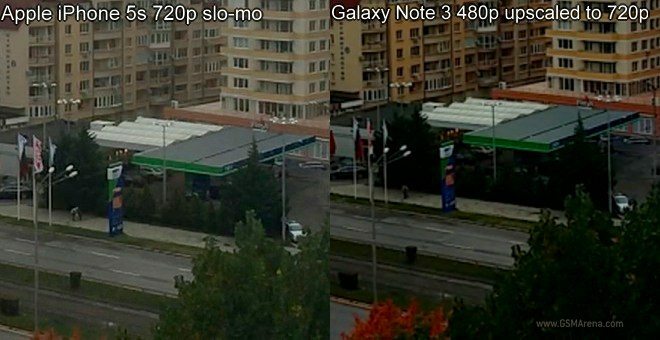 First a slo-mo video was taken using the iPhone 5S, and then the Galaxy Note 3 was used to record a regular 720p video. The results showed that the video taken with the Galaxy Note 3 was much more detailed than that taken with the iPhone 5S, as shown in these screenshots. Following this the 720p video snapshot from the Note 3 was downsized to 480p and upscaled back to 720p again and this resulted in a shot that looked very close to the captured frame from the iPhone 5S. The conclusion to this was that rather than the iPhone 5S capturing video at 720p resolution, the video is actually being shot at 480p and then upsized to 720p. The testing was conducted by GSM Arena who point out that the per-pixel quality is then much lower than we’d expect from Apple, and so the slow-motion clips are not as good as they should be. As you would expect, this is more noticeable when slo-mo clips are played through a TV or monitor than when played on your phone. This seems to be an issue that Apple should be able to fix with an update, and hopefully that will be coming soon. Take a look at the images here of the iPhone 5S slo-mo and Galaxy Note 3 video samples, and see if you agree with the conclusion of GSM Arena? Let us know what you think about this by posting your comments.